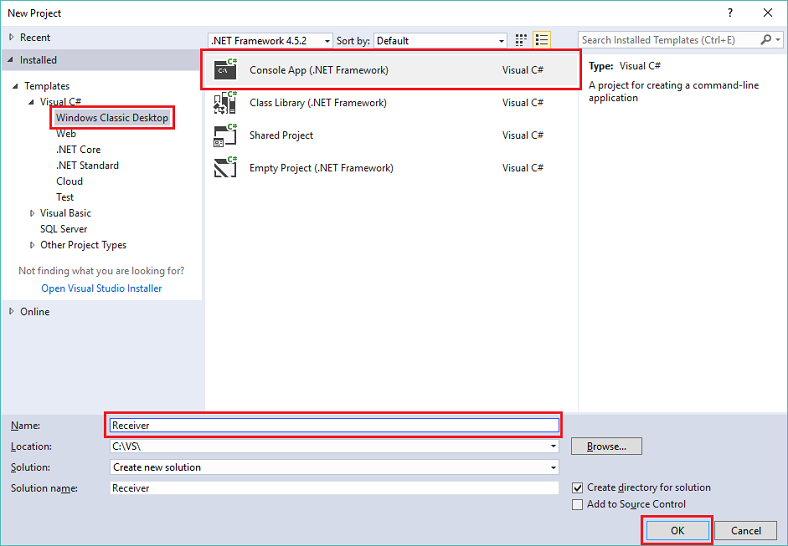 This tutorial shows how to create .NET Framework console applications in C# to send events to or receive events from an eventhub. Microsoft Visual Studio 2017 or higher. Create an Event Hubs namespace and an event hub. 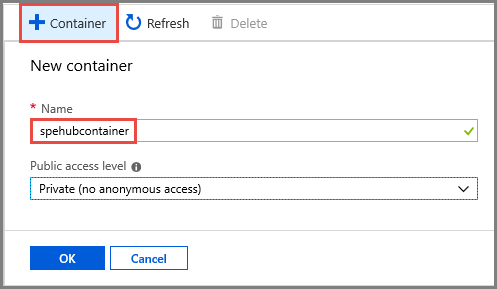 The first step is to use the Azure portal to create a namespace of type Event Hubs, and obtain the management credentials your application needs to communicate with the event hub. To create a namespace and an event hub, follow the procedure in this article. Then, get the connection string for the event hub namespace by following instructions from the article: Get connection string. You use the connection string later in this tutorial. 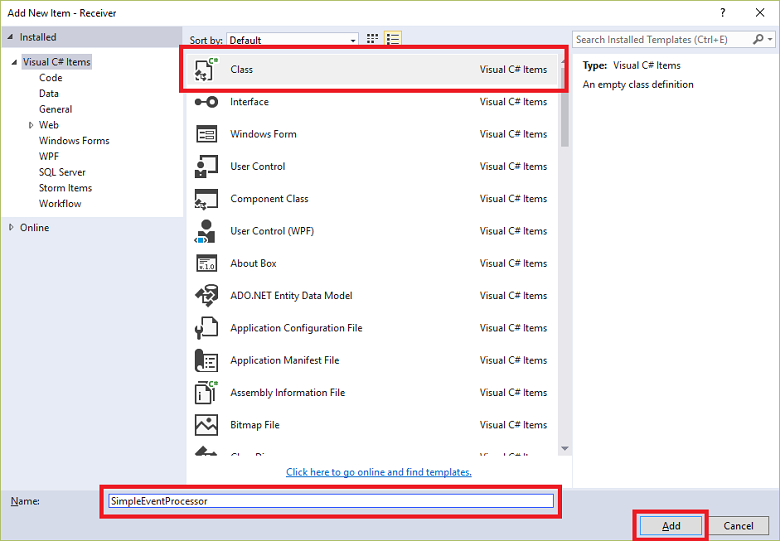 This section shows you how to create a .NET Framework console application to send events to an event hub. In Visual Studio, create a new Visual C# Desktop App project using the Console Application project template. Name the project Sender. In Solution Explorer, right-click the Sender project, and then click Manage NuGet Packages for Solution. Visual Studio downloads, installs, and adds a reference to the Azure Service Bus library NuGet package. Add the following fields to the Program class, substituting the placeholder values with the name of the event hub you created in the previous section, and the namespace-level connection string you saved previously. 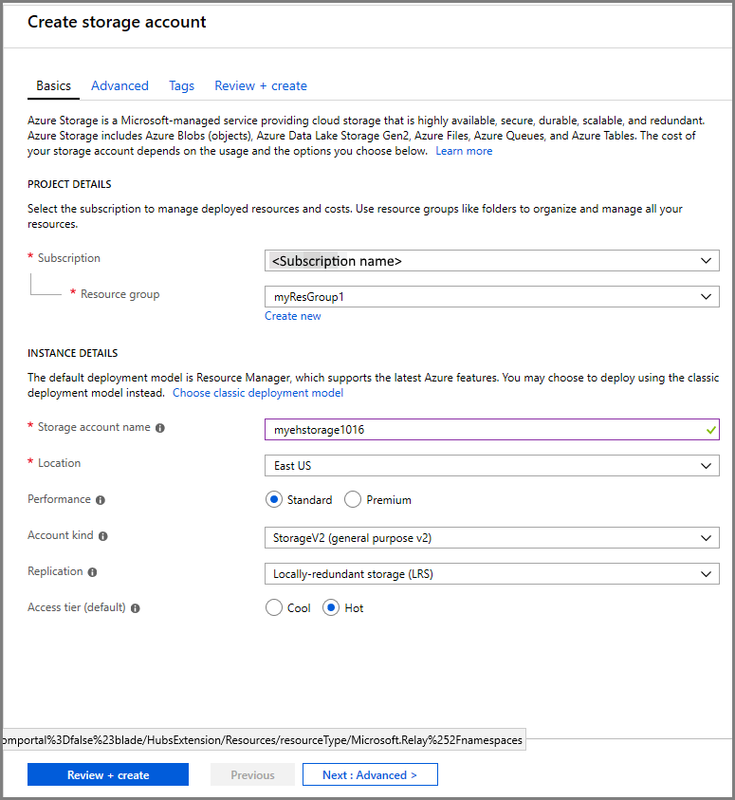 You can copy connection string for your event hub from Connection string-primary key under RootManageSharedAccessKey on the Event Hub page in the Azure portal. For detailed steps, see Get connection string. This method continuously sends events to your event hub with a 200-ms delay. Run the program, and ensure that there are no errors. In this section, you write a .NET Framework console application that receives messages from an event hub using the Event Processor Host. The Event Processor Host is a .NET class that simplifies receiving events from event hubs by managing persistent checkpoints and parallel receives from those event hubs. Using the Event Processor Host, you can split events across multiple receivers, even when hosted in different nodes. In the Azure portal, and select Create a resource at the top left of the screen. Select Storage, then select Storage account - blob, file, table, queue. Enter a name for the storage account. 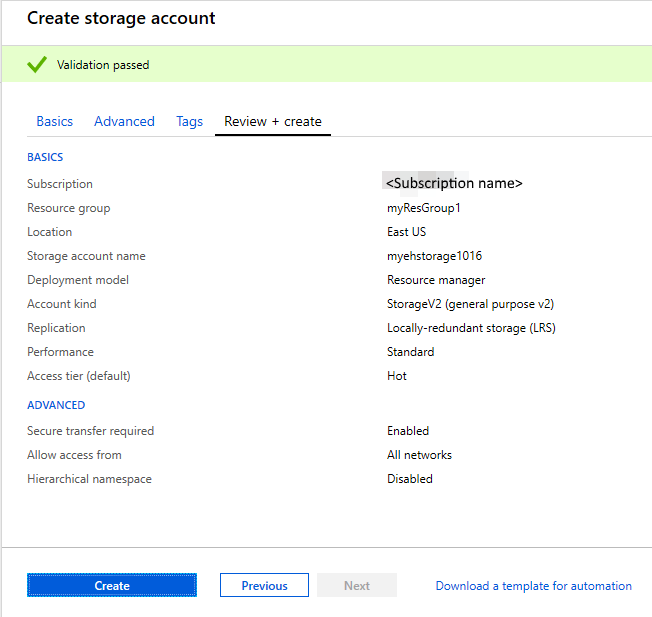 Choose an Azure subscription that contains the event hub. Select the resource group that has the event hub. Select a location in which to create the resource. Then click Review + create. On the Review + create page, review the values, and select Create. After you see the Deployments Succeeded message, select Go to resource at the top of the page. You can also launch the Storage Account page by selecting your storage account from the resource list. In the Essentials window, select Blobs. Select + Container at the top, enter a name for the container, and select OK. Select Access keys in the left-side menu, and copy the value of key1. Save the following values to Notepad or some other temporary location. In Visual Studio, create a new Visual C# Desktop App project using the Console Application project template. Name the project Receiver. In Solution Explorer, right-click the Receiver project, and then click Manage NuGet Packages for Solution. Visual Studio downloads, installs, and adds a reference to the Azure Service Bus Event Hub - EventProcessorHost NuGet package, with all its dependencies. Right-click the Receiver project, click Add, and then click Class. Name the new class SimpleEventProcessor, and then click Add to create the class. This class is called by the EventProcessorHost to process events received from the event hub. The SimpleEventProcessor class uses a stopwatch to periodically call the checkpoint method on the EventProcessorHost context. This processing ensures that, if the receiver is restarted, it loses no more than five minutes of processing work. Replace the Main method in the Program class with the following code, substituting the event hub name and the namespace-level connection string that you saved previously, and the storage account and key that you copied in the previous sections.